Excerpt from JCYC Up Close Spring 2016 Parents of preschool-aged children in the San Francisco Bay Area are all too familiar with the high demand for quality, affordable childcare. As an extension of its mission to enrich the lives of the Bay Area’s diverse and multicultural youth, JCYC’s Chibi Chan Preschool, currently located at Pine and Pierce Streets, is expanding to a second location. The preschool’s highly successful childcare service will open its new site at the renovated Booker T. Washington Community Service Center (BTWCSC). The center is currently under construction and is scheduled to open in 2017. For a number of years, Chibi Chan Preschool has had an extensive waiting list, with the number of parents eager to enroll their children in the program far exceeding its capacity. The expansion will allow the preschool to serve an additional 36 children, with one classroom of 12 for two to three year-olds, and another of 24 for three to five year-olds. According to current Chibi Chan Director, Shana Kanzaki, “expanding our preschool facility has always been in the back of our minds.” She adds that this opportunity came about through conversations between JCYC’s Executive Director, Jon Osaki, and BTWCSC Executive Director, Patricia Scott. Like JCYC, BTWCSC is rooted in San Francisco’s Western Addition. The organization has a long history of supporting and partnering with the Japanese American community, dating back to the 1940’s when Japanese Americans were forced into concentration camps during World War II. The BTWCSC committed to caring for many of the possessions of those who were incarcerated during the war and provided shelter to many Japanese Americans after they were finally released from the camps. In 1946, BTWCSC hired a young social worker named Yori Wada who served as the organization’s Program Director and is credited with creating many programs that brought the Japanese and African American communities together. Mr. Wada would go on to become the Executive Director of the Buchanan YMCA and in the late 1960’s serve as a mentor to a group of young people who later formed JCYC. In the same spirit, JCYC isn’t simply opening a second site at BTWCSC, but is becoming part of the community, Kanzaki said. Such crosscultural community-building work is at the heart of both the organizations’ legacies. In addition to hosting the Chibi Chan Preschool, BTWCSC mixed-use building will offer 50 units of affordable housing, including 25 for emancipated foster youth, Kanzaki said. The center will also include an after- school youth broadcasting program. Committed to reaching the under-served communities, one-fourth of Chibi Chan Preschool’s students come from low-income households. Among the preschool’s appeal is its “competitive rates for working families,” Kanzaki said. Meanwhile, the children themselves will continue to benefit from the preschool’s projectapproach curriculum. Each year the students focus on a topic to explore through in-depth investigations. Last year, the students studied “the who, what, where and why of family.” Kanzaki anticipates that the new site will open in the fall of 2017. She advises parents to consider submitting applications to the preschool at least a year to 18 months in advance. For more information about Chibi Chan Preschool, visit http://jcyc.org/chibichanpreschool.htm or call (415) 351- 0955. To download a complete version of JCYC Up Close Spring 2016, click here. Excerpt from JCYC Up Close Spring 2016 Parents of preschool-aged children in the San Francisco Bay Area are all too familiar with the high demand for quality, affordable childcare. 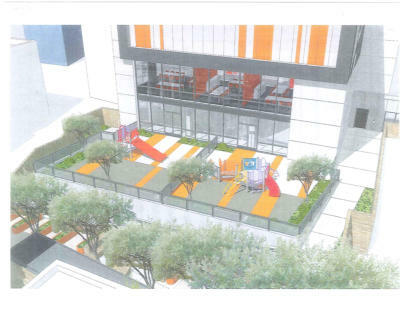 As an extension of its mission to enrich the lives of the Bay Area’s diverse and multicultural youth, JCYC’s Chibi Chan Preschool, currently located at Pine and Pierce Streets, is expanding to a second location. The preschool’s highly successful childcare service will open its new site at the renovated Booker T. Washington Community Service Center (BTWCSC). The center is currently under construction and is scheduled to open in 2017. For a number of years, Chibi Chan Preschool has had an extensive waiting list, with the number of parents eager to enroll their children in the program far exceeding its capacity. The expansion will allow the preschool to serve an additional 36 children, with one classroom of 12 for two to three year-olds, and another of 24 for three to five year-olds. According to current Chibi Chan Director, Shana Kanzaki, “expanding our preschool facility has always been in the back of our minds.” She adds that this opportunity came about through conversations between JCYC’s Executive Director, Jon Osaki, and BTWCSC Executive Director, Patricia Scott. Like JCYC, BTWCSC is rooted in San Francisco’s Western Addition. The organization has a long history of supporting and partnering with the Japanese American community, dating back to the 1940’s when Japanese Americans were forced into concentration camps during World War II. The BTWCSC committed to caring for many of the possessions of those who were incarcerated during the war and provided shelter to many Japanese Americans after they were finally released from the camps. In 1946, BTWCSC hired a young social worker named Yori Wada who served as the organization’s Program Director and is credited with creating many programs that brought the Japanese and African American communities together. Mr. Wada would go on to become the Executive Director of the Buchanan YMCA and in the late 1960’s serve as a mentor to a group of young people who later formed JCYC. In the same spirit, JCYC isn’t simply opening a second site at BTWCSC, but is becoming part of the community, Kanzaki said. Such crosscultural community-building work is at the heart of both the organizations’ legacies. 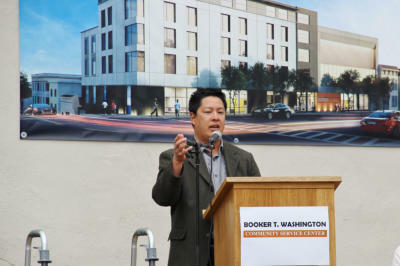 In addition to hosting the Chibi Chan Preschool, BTWCSC mixed-use building will offer 50 units of affordable housing, including 25 for emancipated foster youth, Kanzaki said. The center will also include an after-school youth broadcasting program. Committed to reaching the under-served communities, one- fourth of Chibi Chan Preschool’s students come from low-income households. Among the preschool’s appeal is its “competitive rates for working families,” Kanzaki said. Meanwhile, the children themselves will continue to benefit from the preschool’s projectapproach curriculum. Each year the students focus on a topic to explore through in-depth investigations. Last year, the students studied “the who, what, where and why of family.” Kanzaki anticipates that the new site will open in the fall of 2017. She advises parents to consider submitting applications to the preschool at least a year to 18 months in advance. For more information about Chibi Chan Preschool, visit http://jcyc.org/chibichanpreschool.htm or call (415) 351-0955. To download a complete version of JCYC Up Close Spring 2016, click here.